What happens when you mix women, white water, and chocolate fondue? SALT LAKE CITY, UTAH—She keeps coming back. For the last seven summers, Susan Soloyanis, 59, has made sure she ends up floating down a wild river with a bunch of girlfriends-to-be. “It is my time for rejuvenation, to be free from any outside influences like phones, the media, news, my work,” says Soloyanis, who admits that as a single woman these river trips have allowed her access to beautiful areas she otherwise would not feel safe going alone. Every year dozens of women—sisters, mothers and daughters, grandmothers, friends, and strangers—join Holiday River Expedition’s female guides on river trips tailored to those of us sporting the X chromosome. It is fertile ground giving rise to river-trip features—some planned, some not— that have a strikingly female feel: Yoga, massage, river “pedicures” and mud baths/exfoliating, chocolate fondue, red wine and fresh, organic meals. And inevitably, spontaneous laughter, shared wisdom, and support. “Women tend to relax more by virtue of it being all women,” admits guide Jen Davidson. “A frivolity and relaxation happens as well as a kind of empowerment.” Empowerment and transformation evolve as guests take on an outdoor-river environment, perhaps for the first time, find nourishment in nature, and witness skilled female guides tackle the river, with opportunities to row themselves. The guides will lead side canyon hiking, give the guest room for solitude and encourage time to relax, reflect and rejuvenate. 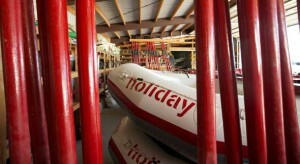 Holiday River Expeditions began in 1966, when Dee Holladay and his wife Sue took the plunge to become river outfitters. Due to its respect for the lands, rivers, guests and employees, the family-owned-and-operated company has grown exponentially. Each of its guides is professionally trained in first aid and river safety, and with over 44 years of experience, the company provides guests the opportunity explore the nation’s wild lands safely and securely. 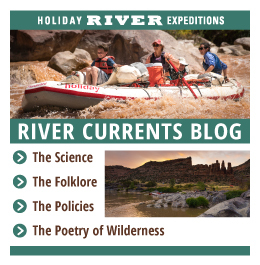 Holiday River Expeditions has a philosophy to protect the environment through education and conservation, and as such, uses oar-powered and paddle rafts.